This volume marks the beginning of the Documents series of The Joseph Smith Papers. When complete, the Documents series will publish more than a thousand documents created, authorized, or owned by Joseph Smith, including each of his revelations in its earliest form, reports of his discourses, and correspondence. Also found in the series are articles and editorials he wrote for newspapers, minutes of meetings in which he participated, and records of his ecclesiastical administration. This first volume of the Documents series consists of documents written from July 1828 to June 1831. Among the contents of this volume are more than five dozen revelations that were presented in the first-person voice of Jesus Christ, including texts later published in the Doctrine and Covenants, the expansive “visions of Moses” (now found in the Pearl of Great Price), and revelations never canonized. In addition, several documents in this volume trace the process of translating and printing the Book of Mormon, as well as early efforts to evangelize using the book and its message. 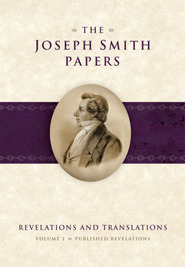 These texts provide the earliest textual insights into Joseph Smith and the founding of what was then called the Church of Christ. They offer glimpses into the religious leader’s thoughts, concerns, and initiatives in a crucial early period of the religious movement he started. This book allows the reader not only to study Joseph Smith but also to gain a greater understanding of his followers and the millenarian movement they participated in during the Second Great Awakening. GRANT UNDERWOOD is a professor of history at Brigham Young University. ROBERT J. WOODFORD is a retired instructor at the Latter-day Saint Institute of Religion at the University of Utah.